• Ultra slim: only 5 mm! • Lightweight - only 25 gr. - Unprecedented high dynamic range (70 dB). Detector is very easy to use: it has intuitive touch panel operation with just two buttons operation. 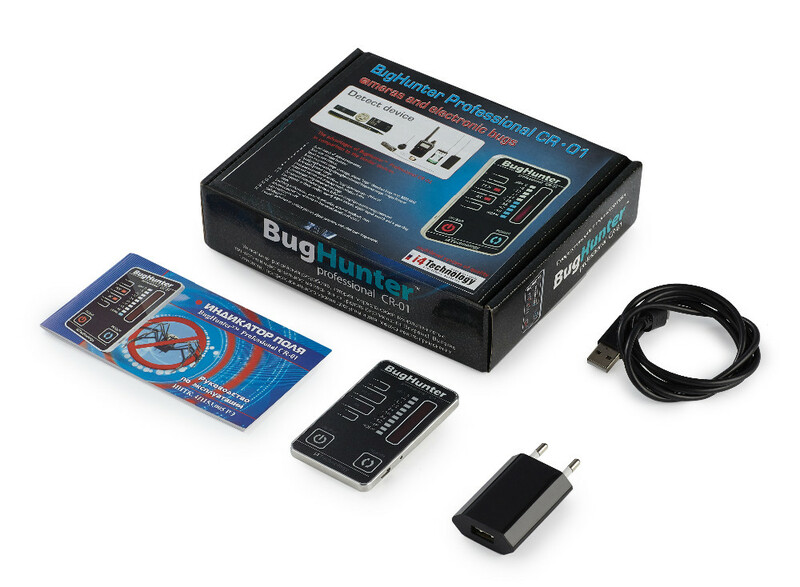 BugHunter Professional CR-01 is intended for search and detection of wireless transmitting devices (bugs, wireless microphones, hidden wireless cameras, even cell phone jammers, WiFi and all other spy devices) in near field, as well as working cell phones with GSM, DAMPS, AMPS, DECT standards. 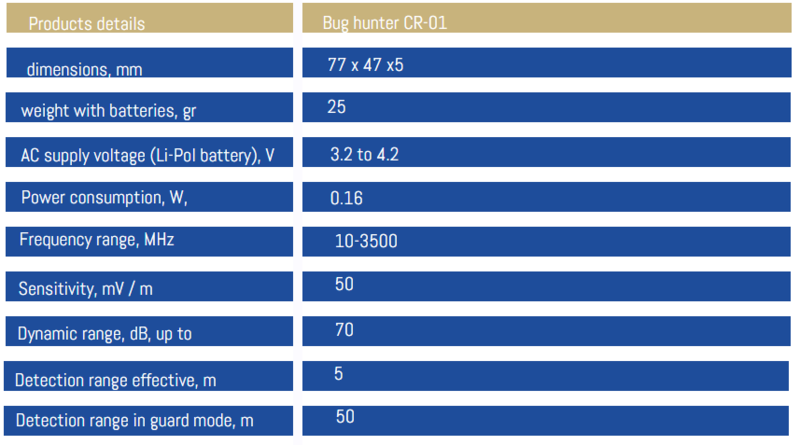 Stable work is guaranteed in the whole claimed frequency range with super high sensitivity of search - 50 mV/m. Professional high-speed microprocessor based system is specifically designed for detection and location of any radio transmitting devices: analog and digital bugs, hidden wireless cameras, cell phone jammers, 2-way radios, walkie-talkies, radio, tracking beacons, cellular and cordless phones, wireless microphones and any "wiretapping" devices. 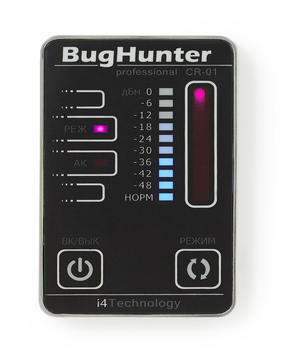 BugHunter Professional CR-01 uses a special filter that automatically blocks all background levels of signals and minimizes interference from GSM-towers which allows you to use a detector even in the close proximity to noise sources. 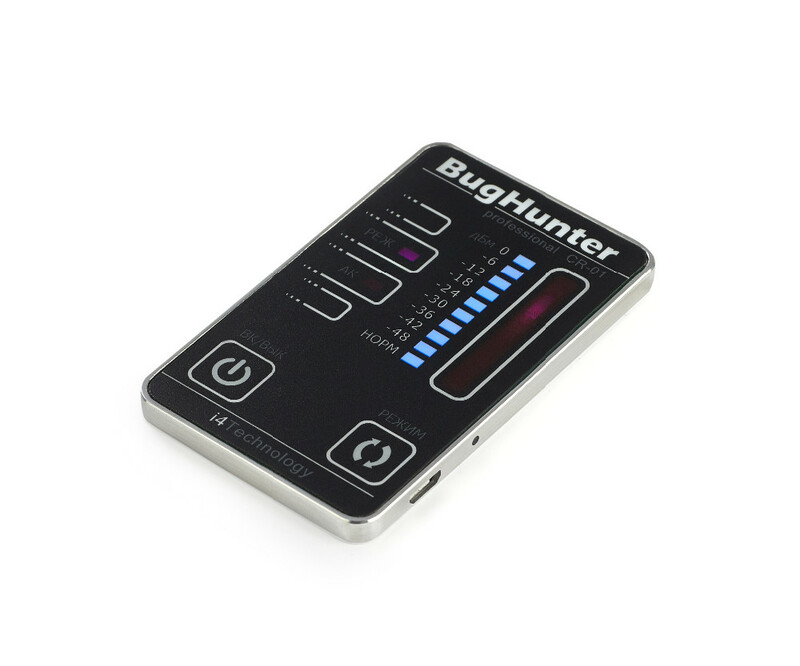 GSM filter allows detecting bugs and "wiretapping devices" very effectively in any difficult environment. 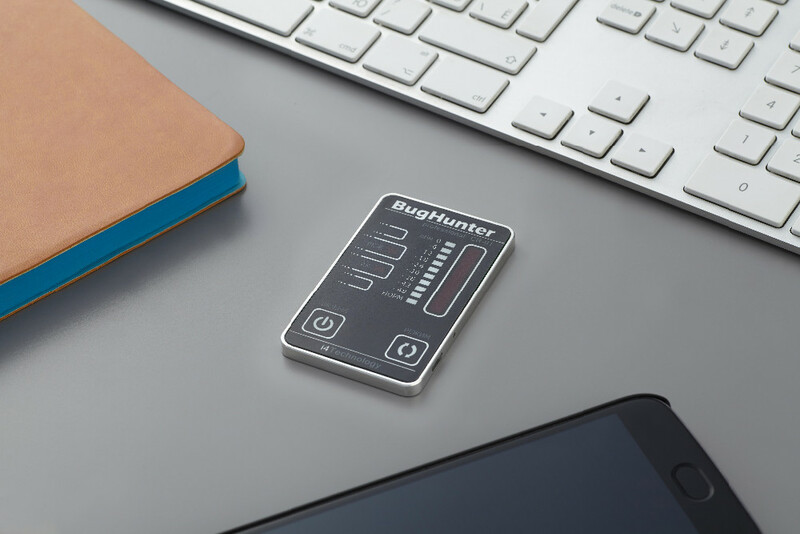 BugHunter will automaticly adjust to background levels of radio signals and will not react to extraneous noise, device will detect only a local spy bug. • Three alarm modes: Audible alarm; Acoustic feedback; Soundless.